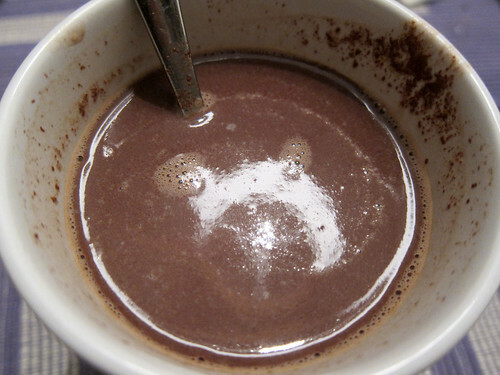 Someone at home was hooked on making hot chocolate but wasn’t happy with what mixes were available at the shops. Most of the hot chocolate mixes at the supermarket were too sweet or too powdery. I ended up buying Blai a bar of Lindt dark chocolate for him to make it himself but he couldn’t be fussed to actually prep it and ate the entire bar instead. Huh. 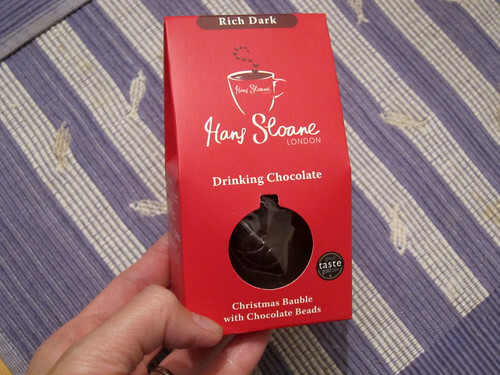 When the opportunity arose to try Hans Sloane drinking chocolate, I jumped at it. This would make our nightly hot chocolate ritual actually happen! Yes, the company is named for the eminent physician and botanist who, in addition to the rest of his work and collecting, developed a way of mixing cocoa with milk to make a drink and pioneered drinking chocolate in Europe. The company were kind enough to send me a pack each of their milk and dark chocolate beads and also a Christmas special, a single serving dark chocolate bauble filled with more dark chocolate beads. That last little Christmas ball was the first thing we tried. What I was particularly impressed with was hot smooth the hot chocolate was – when I’ve made hot chocolate from scratch before, I’ve always had to whisk the mixture but here we only used a spoon. 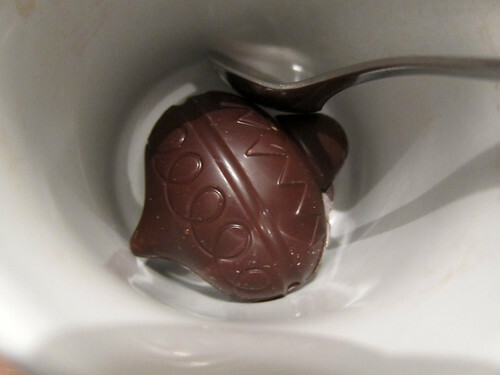 The flavour was excellent – the dark chocolate was rich and coated the mouth nicely. If there was a problem, it was just a teeny bit too sweet but it was still much better than anything available at our local supermarkets. It certainly deserved its Great Taste Awards! We’ll be working our way through the other packs through the winter. The bauble retails for £2 (it would make a nice stocking stuffer) and the bags of beads are £4.99 each (270g each). 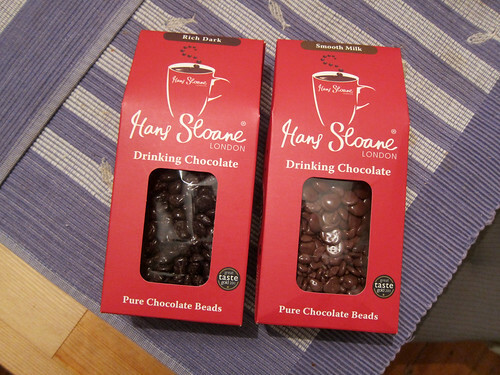 Hans Sloane hot chocolate can be purchased at Tesco, Waitrose, some independent shops and through their website. 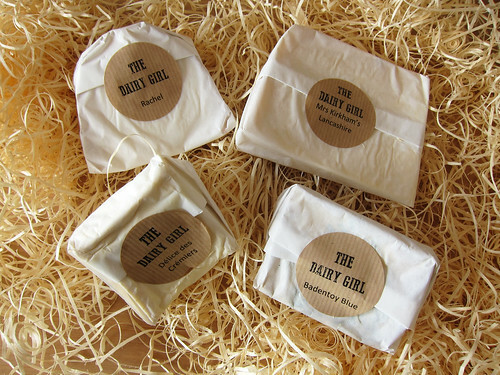 I recently was invited to sample a cheese box from The Dairy Girl, Rachel, who offers a monthly cheese box subscription with lots of flexibility. Now, I’m not the biggest cheese eater but I do appreciate it, and this appreciation most likely increased since I’ve been with Blai as he loves it. He loves cheese and this opportunity to try new cheeses was not one to turn down. I’ve also been tempted to try one of these monthly box schemes (I’ve been sitting on the fence as to whether to try Birchbox). 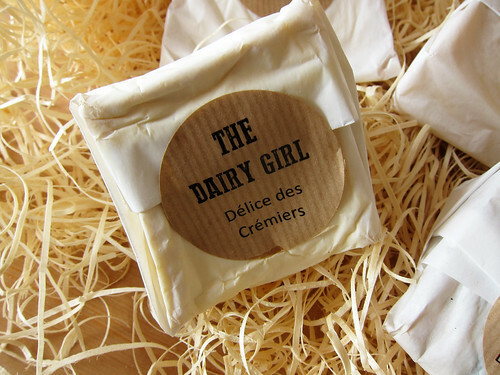 Rachel travels the country visiting producers and discovering cheeses that she introduces to customers via her boxes. You can tailor the boxes to your preferences – different scales are available when it comes to blues, sheeps, hardnesses, strengths, vegetarian, etc. Of all that was available to me, I chose ‘Blue cheese – Not convinced, introduce me gently.’. 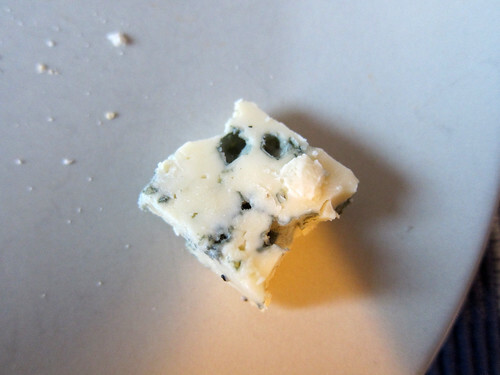 I’ve never tasted a blue cheese I enjoyed; forgive me but I think they taste of mould and feet (which, of course, is exactly what makes it blue – the mould I mean, not the feet). The courier delivery arrived on the day agreed. Nestled inside the box were these four cheeses as well as ice packs to keep them cool. Four cheeses – four generously sized cheeses that were going to last us almost two weeks. We had plans the night we got the cheeses so they first went in the fridge until the next day, when we made the cheeses the main focus of our dinner, accompanied with bread, crackers, hams, dried fruit, nuts, a salad. What helped us that night were the cheese cards that accompanied the box – each cheese card describes the cheese, where it’s made, what it’s made, suggestions on how to serve it and what to drink with it. Very helpful! 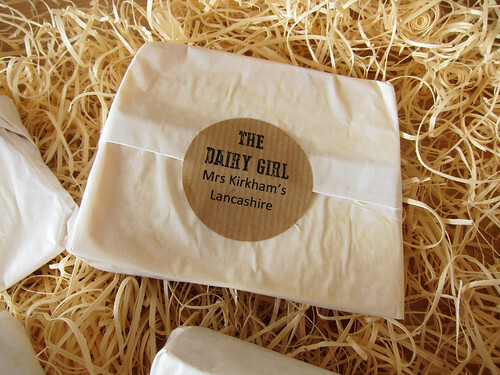 Mrs Kirkham’s Lancashire, made by Graham Kirkham in Lower Beesly Farm in Lancashire, was that crumbly rich cheese that goes well with strong pickles. A classic. 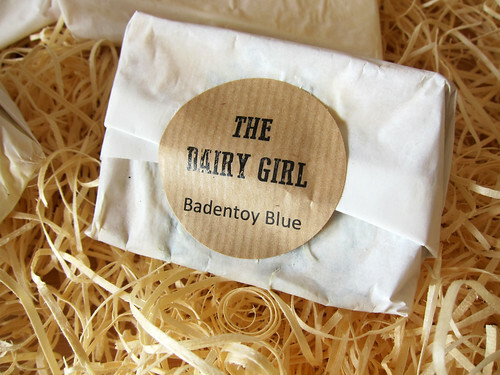 My nemesis showed up as a Badentoy Blue, made at Devenick Dairy in Aberdeenshire, Scotland. It’s a mild blue cheese so perfect for nervous losers like me! See that little square below? OK, so this turned out to be my least favourite but that’s the square I managed to consume without gagging. To the cheese’s credit, Blai (a blue cheese lover) declared it delicious and he ate most of it! What I really liked about the box I received was that while there was clearly a focus on UK producers, there was also a sampling of what’s best from the continent. 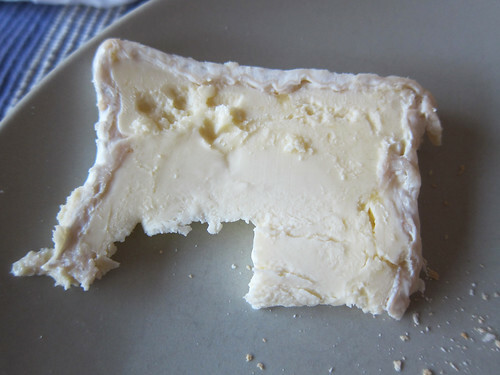 A Délice des Crémiers from Burgundy, France was an amazing triple cream cheese that stumped us at first. When cold, straight out of the fridge, the cheese has the texture of … cold butter. And eating it cold made it melt like … cold butter. The trick is to have it have room temperature when it oozes and is beautifully creamy. Do make sure to take it out of the fridge early! 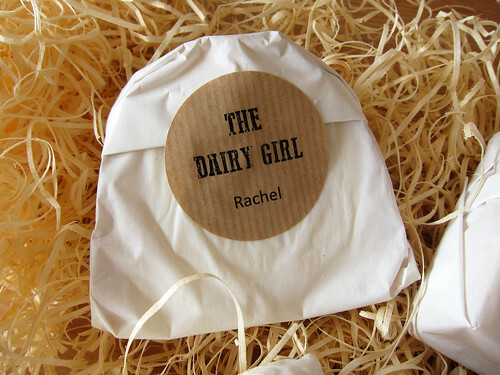 Finally, there was the Rachel (this is the same name as the founder of The Dairy Girl – coincidence? 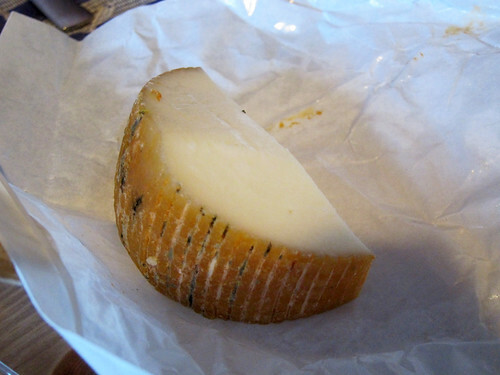 ), a washed rind goats cheese made by Roger Longman and Peter Humphries at Whitelake Cheese in Somerset. This was our favourite of that box – it’s a very versatile cheese that’s good for both eating and cooking and had a mild, nutty, goaty flavour. We actually worked it into a salad that night too. 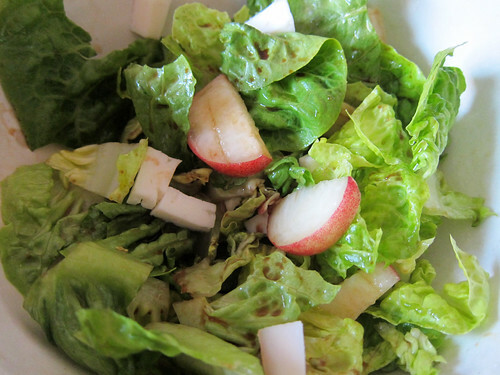 For two people, cut up one or two large little gem lettuces, slice a flat peach and toss in some chunks of Rachel cheese. Extras that really work here (we tested it out the next day again) are dried cherries or cranberries and something quite crunchy like toasted seeds or croutons. Dress with only extra virgin olive oil and good balsamic vinegar. I think we almost cried when we used up all the Rachel. Now, the cost. A box like this one (4 cheeses, about 900g in total) costs £24.95 + delivery. 3 cheese and 5 cheese boxes are also available. I think it’s a little more than you’d buy elsewhere but then I appreciate the fact that it comes to my door and that it’s a surprise every month (or so, like I said, you can tailor how often you’d like a box). And then Rachel also chooses cheeses to your preferences and provides lots of information on each one. All in all, I think it’s an excellent box. Thank you very much to The Dairy Girl for the cheese box! Rachel has kindly provided readers of Tamarind and Thyme with a discount that will give you £10 off any monthly box (that’s a good deal!). The code (‘T&TCHEESE‘) can only be used once per address and must be used by 9 August 2014. 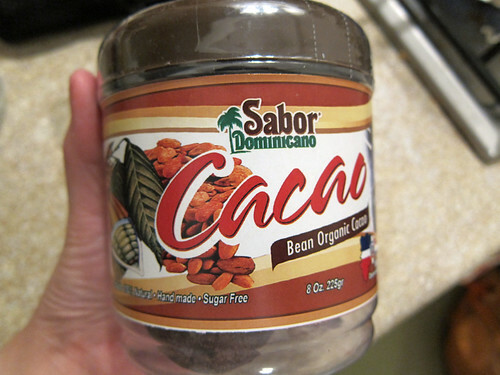 A friend of mine went on a last minute trip to the Dominican Republic last year and brought back a most interesting jar of cocoa balls for me. After a lot of questioning on Twitter, it turned out that this wasn’t for hot chocolate but for a Caribbean chocolate drink they call cocoa tea. I believe this is pure processed cacao, complete with cacao butter, in ball form. From what I gather online, they also come in sticks, which, though less aesthetically pleasing, are easier to grate. Well, after many months of procrastination, I finally thought about making us some cocoa tea and opened the jar. I cobbled together a set of instructions based on what I found online and what was on the side of the jar. In a small pot, I placed half a stick of cinnamon, a bay leaf and grated in about 1/8 of a nutmeg. In went 500ml of semi-skimmed milk and the whole pot was set on a medium heat to simmer. Meanwhile, I grated up one of the cocoa balls (each is about the size of a walnut). When the milk was simmering, the grated cocoa was added and whisked in until well combined. As there’s no sweetening in these balls of cacao, some sugar was also added to taste (about 1-2 tbsps, I think). Finally, a little bit of cornstarch slurry gave the thin mixture a little thickness. The result was delicious! Not too sweet, a bit bitter, very deeply chocolaty but not in a cloying way. I might try to grate the cocoa ball a little finer as we were chewing a little on the larger cocoa nibs but this was not unpleasant. If you do manage to find cacao like this, do try it! We were in Nagoya for a work conference and for each day of the main conference, we would each pick up a bento box and juice/tea box for lunch. Now these were clearly mass produced bento boxes (they would have required about 1000 bento boxes per day) but the quality and variety of the food in each box was astounding. On the first day, we received this beauty. It was a bit rice heavy but the fried fish, prawn (I got a second because my colleague couldn’t eat hers) and little hamburger were lovely. Everything was delicious. 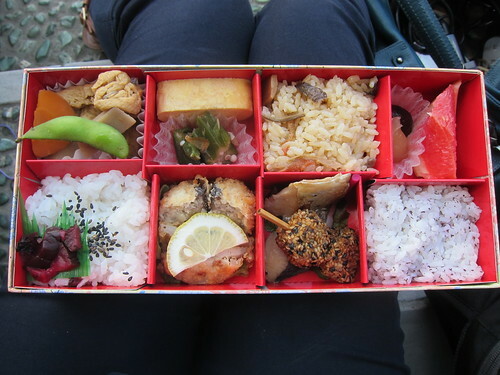 Our second bento was in the most beautiful box that I even managed to keep and bring back to London (after emptying out the food covered dividers!). Again there were three lots of rice but this was improved by having one of the rices cooked together with carrots and mushrooms. The sweet included in the top right corner was a curiosity – two large beans cooked in syrup! In the top left, there was an excellent braised tofu bundle filled with vegetables. 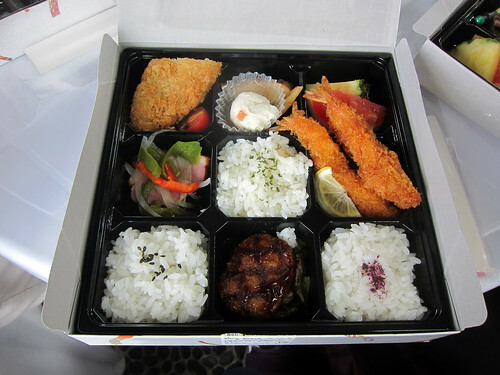 Of all the bentos we had at that conference, I liked this one the best. 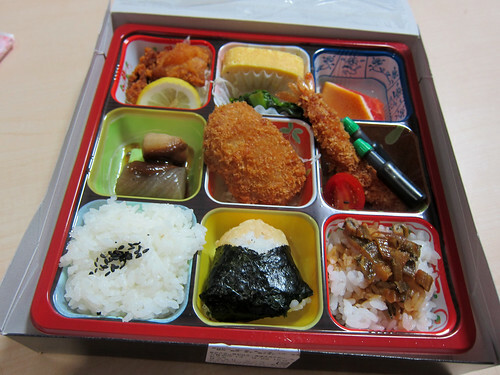 The bentos handed out on the third and last day had one of its rices in the form of a Nagoya speciality – tenmusu, an onigiri with a prawn tempura in it. This last box was a bit fried-heavy (the tenmusu, the prawn, pork in the middle and karaage in the top left corner) but just look at the designs printed on the food dividers! We even got a taste of ekiben, the railway bentos that can only be purchased at train stations or at special ekiben fairs. 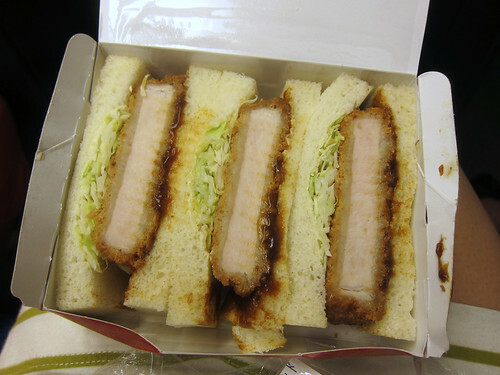 After our time in Nagoya, we took the shinkansen to Tokyo and while I bought this katsu-sando (most convenient for a train journey where you’ve not got a tray because your suitcase is in the way)…. 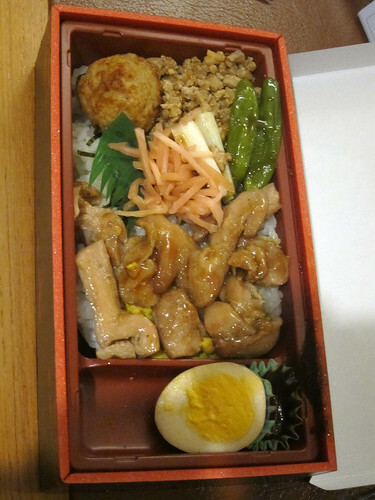 ….my colleague purchased this chicken yakitori ekiben that’s one of the specialities of Nagoya. He said it was brilliant. I only wish there had been more time and more stomach space for me to try more bentos on this trip! 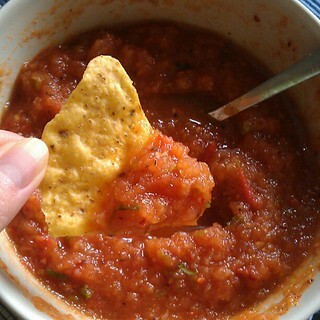 I was sent a jar of Gran Luchito recently and the first thing I thought of was to incorporate this smokey Mexican chilli paste into a table salsa to eat with tortilla chips. 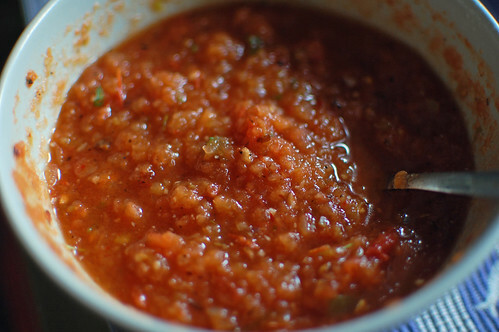 Those jars of ‘mild’ and ‘hot’ salsa they sell at the supermarket are absolutely awful (the majority seem to be much too sweet) and homemade is just so much better. This is what I came up with – a recipe involving tomatoes, onion and garlic all charred on the stove. What fantastic flavour it had! Smokey yet fresh and just perfect as part of an afternoon snack. We demolished one batch along with half a bag of tortilla chips and next time I’m going to double it. Or perhaps I’ll put some on a taco or in a burrito. Of course, you don’t have to use the chilli paste – you could toss in a couple of your own roasted chillies instead. Heat a heavy frying pan over high heat and lay in the tomatoes, onion, garlic clove, spring onion and jalapenos (if using), turning occasionally until blackened and blistered on as many sides as you can achieve. Take out the ingredients when blackened and leave to cool – the timings will obviously be different for each ingredient. For the tomatoes, onion and garlic clove, peel off the blackened skins and then chop the flesh roughly. Toss it all into a food processor or, as in my case, a mini chopper. Add the spring onion, roughly chopped, and also the chilli paste, or the grilled jalapeno (peeled). Pulse until just blended. 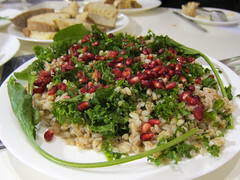 Add salt, lime juice and fresh coriander to taste, stirring it all in well. Serve. I’ve grown quite fond of the Gran Luchito paste. 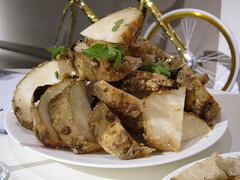 It’s also great on its own or stirred into a pasta sauce or spread on a sandwich. I’ve been adding it to lots of things. It’s very good stuff with a good heat and great smokey flavour. Also just before the holiday season, I was invited to an event by Seafood from Norway to highlight the seafood delights from that Nordic country; this was a one-off supperclub to promote sustainable Norwegian Seafood in the UK and it was to be catered by Signe Johansen, cookbook author and brunch/supperclub hostess extraordinaire. The location was Republic of Fritz Hansen in central London, a gorgeous shop selling the best of Scandinavian design (why has no one told me of it?!). The table was already starting to fill up with delicious morsels while people were arriving to the shop. 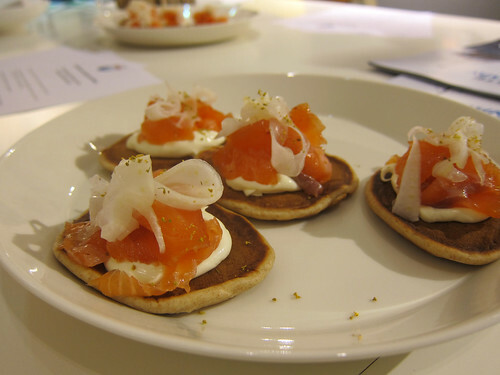 Cured salmon with a shot of Linie aquavit, rye pannekaker, sour cream and pickled fennel was a delicious, and substantial, bite – I loved the pickled fennel with the sour cream and the cured fish. 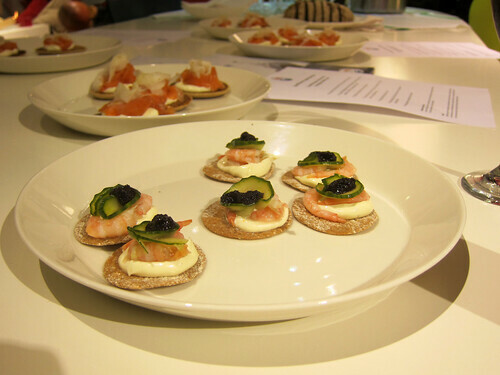 If I had to choose favourites though, the other canape floated my boat more – the Sweet Norwegian prawns with wild dill pollen mayonnaise, lumpfish roe, pickled cucumber on sourdough crisp bread. These light little bites were perfectly balanced – creamy, crispy, sweet, salty, sour. Yes, yes, I do like Norwegian prawns, thank you very much. 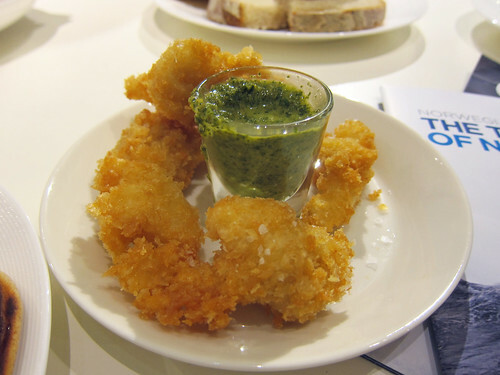 Battered cod cheeks with dill, anchovy and pickled cucumber salsa were another favourite; we were burning our fingers and spilling that moreish green sauce everywhere as we hastily scooped it up. 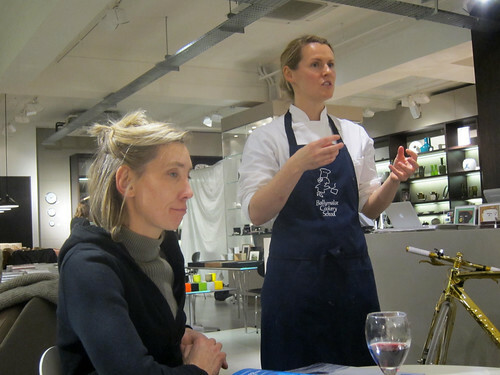 At this point, Signe emerged from the kitchen to tell us all about her Norwegian background and her love for seafood. The menu was sort of a taster of what a Norwegian Christmas table could feature if it was only all about the seafood (I think meat does feature traditionally). Completely unbeknownst to us, the woman sitting to Signe’s right in the photo below was the award winning Bridget Hugo, who runs Bread Bread in Brixton. Bridget’s breads were pretty spectacular. 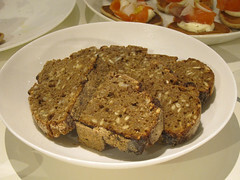 The brown one below was made of all rye and included slightly fermented rye grains. 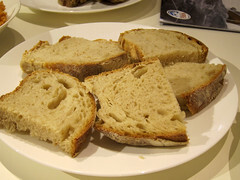 The half whole wheat also included some white flour and rye flour. Both were great with a good schmear of butter and we ate plenty of it just as is. 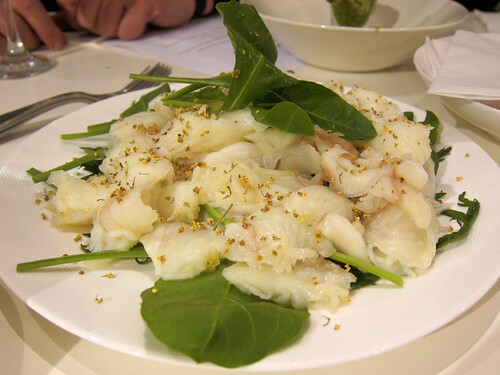 We also scoffed quite a bit of bread with the next dish – Lightly-cured halibut with lemon and elderflower. Elderflower and fish? It was absolutely fantastic and I could have easily cleared the entire platter. 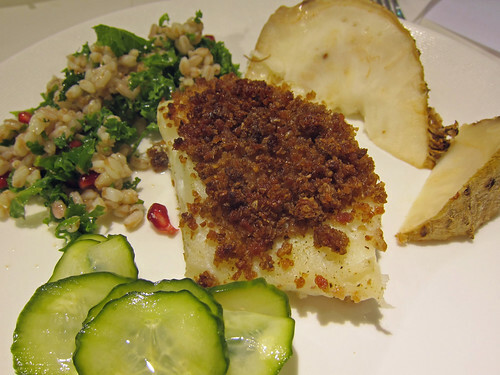 It was my first time eating halibut in this cured way and I loved it. Platters of salt-baked celeriac and a colourful kale and spelt salad now appeared on the table, ready to accompany our main course of Roast haddock with bacon and rye crisp. And here was my plate. A modest serving as I had filled up on uh…prawns on crispbread. The haddock was lovely but I’m not a fan of the rye bread crisp on top. I understand that this topping is commonly used to top apple crisp in Sweden… and at last year’s Swedish Blind Date, it was made clear to me that it is perfectly awful. It’s indeed one way to use up leftover bread but I’ll give it a miss! …which I passed and instead went straight for her fantastic homemade pepperkaker. A brick of brown cheese was also brought out and surprisingly, it pairs well with the pepperkaker. Thank you very much to Lisa from Bray Leino for the invitation! It was a great introduction to Norwegian seafood and Norwegian cuisine prior to my business trip to Oslo. For Norwegian Seafood in London, ask your local fishmonger or supermarket fish counter. I’ll be on the lookout for those prawns. 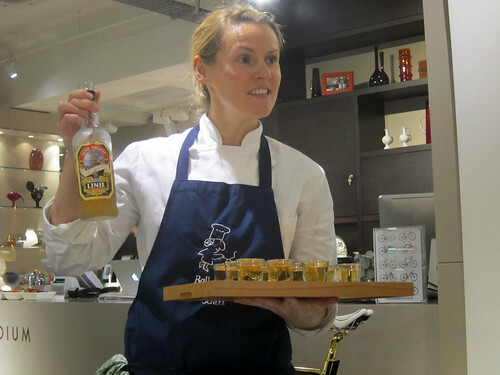 To try some of Signe’s cooking, take a look at her website for updates. I was very keen to visit Pierre Herme (in Paris) in the summer as I knew ice creams were going to be available at that time of the year. 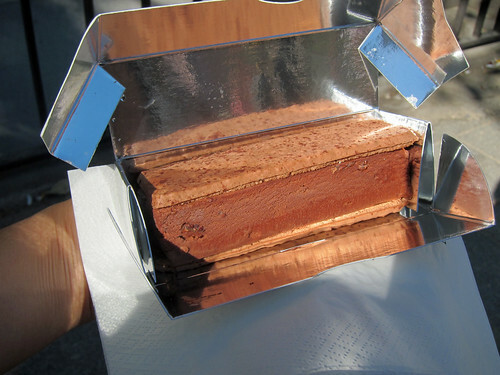 We chose two Miss Gla’Gla ice cream sandwiches and gleefully ran off to a nearby park bench to share the contents of our cold silver boxes. The Miss Gla’Gla Infiniment Chocolat was filled with chocolate ice cream speckled with nougat with cacao nibs and fleur de sel and Sarawak pepper. Sandwiching this filling were two chocolate macaron biscuits. Yes, this was as rich as it looks! (Recently I’ve not been able to finish large, heavy chocolate desserts.) 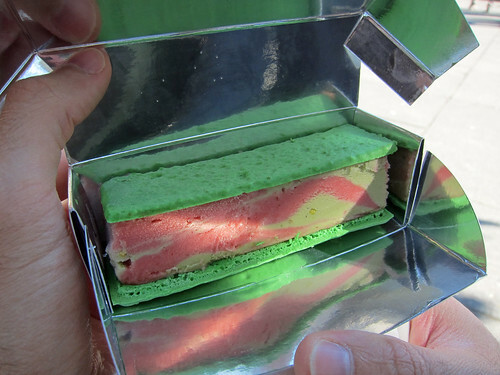 I did love the use of thin macaron shells in the ice cream sandwich and the ratio of ice cream to biscuit. The Miss Gla’Gla Montebello was bright green and contained a swirled mixture of pistachio ice cream and strawberry sorbet between the macaron layers. This was probably my favourite of the two as it was more refreshing and not as rich. The downside? We found a whole pistachio shell in our ice cream sandwich – I hope this was a one off! Each Miss Gla’Gla was €6,20. 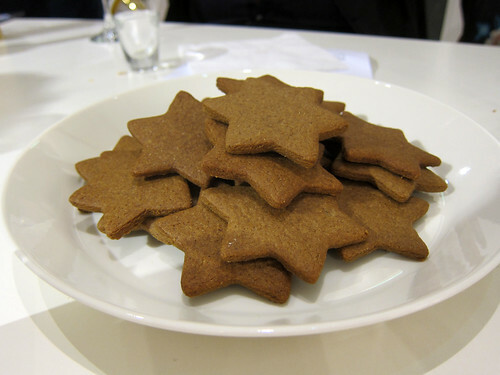 They’re not a bad little treat and I do hope they bring them to London! We went to the branch on rue Bonaparte.